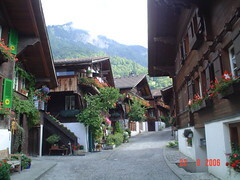 A traditional village streeet in the town near Interlaken, which is the home of Swiss wood carving. We went on to Interlaken where we enjoyed a fondue for luch. From there we went to Grindelwald by train. Unfortunately the Eiger was hidden in clouud. Click on the photo for more views from the day.